Our best selling cream for compromised skin. Deep acting, quick relief for all types of skin issues. It’s amazing what this all natural skin cream can do. Check out the reviews below! Our best selling Skin Therapy Emu Oil Cream is perfect for any compromised skin condition and should be used daily for excellent results. This ultimate, all natural cream is enriched with pure Emu oil, a skin healing oil with transdermal abilities to absorb deep into the tissue while transporting other ingredients and constituents for quick, effective relief. 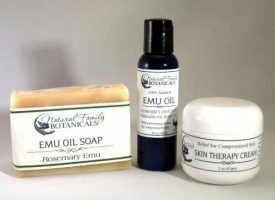 Emu oil is similar in makeup to human skin which is how it can be so easily absorbed. 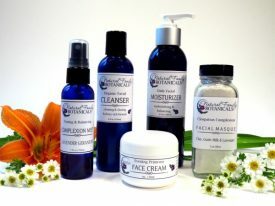 Our Skin Therapy Cream also contains our custom made and designed Green Oil which is an infusion of organic and wildcrafted skin loving herbs such as comfrey, calendula, chamomile, plantain, chickweed, and St. Johns Wort, plus organic tea tree and lavender essential oils creating an extremely therapeutic, non-toxic, skin treatment. Many of our customers who try our Skin Therapy Cream claim amazing results, making this our #1 seller. Our results oriented Skin Therapy Cream contains a generous 20% emu oil. Click Here for amazing details about the benefits of emu oil! Organic aloe vera gel, distilled water, emu oil, organic virgin olive oil infused with organic herbs of calendula, comfrey, plantain, chamomile, yarrow, chickweed, lemon balm, and St. Johns wort, avocado oil, vegetable emulsifying wax, palm stearic, organic jojoba oil, non-gmo vitamin E oil, pure essential oils of organic lavender, organic Australian tea tree, geranium, organic rosemary extract, potassium sorbate, silver dihydrogen citrate, non-gmo citric acid (derived from fruit, corn-free). Wow. Just wow. I purchased this at the suggestion of our friend Kathy Bales who also made a rave review of this product for my 7 month old son. When he was 5 months old, he started getting his first teeth and was slobbering profusely. The saliva began to irritate his delicate cheeks so much he had a nasty, angry rash. It was itchy so he would scratch it and it would bleed and ooze. It was crusty and painful to look at. I was desperately trying to keep it clean, keep his nails short, and keep it moisturized. I put the Honest Company’s “organic healing balm” on it every time I changed his diapers, but after two months of battling it, it hadn’t gotten much better. I’d see change for a little while and it would be right back within a day. So I bought this cream. It came on Thursday afternoon so I put it on after baby’s bath that night. It is Saturday morning. The redness is greatly reduced, the bumps are fading, and I can see almost normal skin color and it has only been 2 days. Praise God this stuff works! Smells nice too! Very thick and not greasy, absorbs very well and leaves even the most angry skin soothed and moisturized. I love the ingredients are safe enough to use on my baby. I am now trying it on his eczema on his pudgy little legs and arms. I will be trying it on my husband and 3 yr old daughter too. We all have skin issues so this has been a huge blessing to discover! 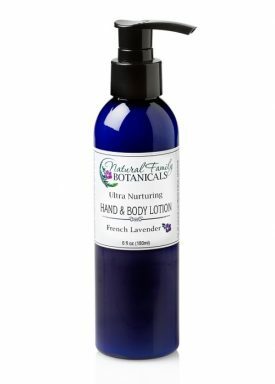 Thank God for Natural Family Botanicals! Miracle product! I had extremely dry skin above my eye lid and this healed it quickly! I started using it Thursday night and by Monday my skin was completely healed. I now use it every night all over my entire face to keep me moisturized. Smooth texture and very light. I love it! Love this product! We’ve been using this constantly on everything skin related. Every year at least a few people in our home end up with sunburn on several occasions and I immediately apply this cream, it works overnight! We also use this on cuts, scrapes, scars, severely dry skin. The list goes on. I definitely recommend this to everyone! Thanks again Kelly! I have been using this product for several years now. The Skin Therapy Cream works FAR better than any prescription or over the counter product/lotion I have used for eczema. Mine and my son’s severe eczema was healed using this product in a fraction of the time it took for a prescription to work. Unlike the prescription, it is soothing and didn’t sting and burn. When my son was 8 this was the only thing he would use because it didn’t hurt when applied. He is 16 now and he still uses it when needed…even around his eyes and on his eye lids where most products say not to use it. I recommend it to everyone I know or meet who suffers with any type of compromised skin. Those who have tried it have not been disappointed! They rave about it too! I keep it on hand and make sure I never run out. Since using this product daily, I have not had eczema from dish detergents and cleaning products on my hands like I used to. It helps prevent it! This is truly a miracle cream for us! I had horrible eczema on my hands for years. ANY lotion/cream I tried, including sensitive skin Eucerin products (recommended by my dermatologist), only further irritated my skin. This is truly the only cream I can use on my hands. I started using NFB’s soaps exclusively years ago and that alone cured my eczema. This cream has been incredible in maintaining my now healthy skin. I am a huge fan of this cream – not just for compromised skin, but for my everyday face cream! I have had dry, sensitive skin for years, and this cream has turned that around. It keeps me moisturized, but has also reduced the sensitivity of my skin in general. I give it to everyone! Your Skin Therapy Cream is wonderful. I have psoriasis and your Skin Therapy Cream soothes and helps clear up the dry patches. It also works wonders on chapped cracked hands. I have never found anything that works as well. I am never without it. This is a must have for our family. 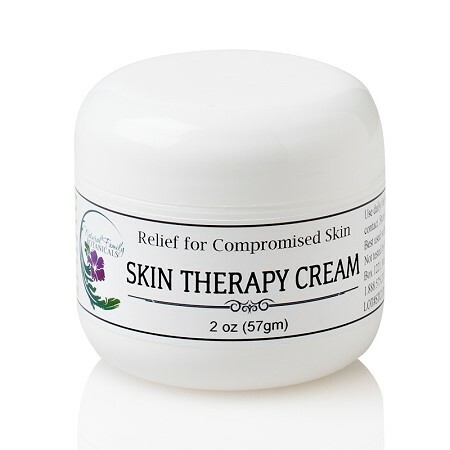 We have been using Skin Therapy Cream for several years for rashes, psoriasis, sunburns and more. It soothes dry skin and relieves itching associated with many skin problems. It always goes with us when we travel. This feeds my skin with its healing plants substances. My top pick! This skin therapy cream loves my face and my face loves it back! I like the very light fragrance and the way it easily absorbs into my skin. This cream is truly amazing!! We have different skin issues in our family from dermatitis to eczema. This cream clears up all of it!!!! Label says relief for compromised skin. My skin isn’t compromised, just aging. I’ve been using this product for years now and my skin is in beautiful condition and looks younger than my years. I alternate between this and Evening Primrose Cream every morning beause I like them each equally. 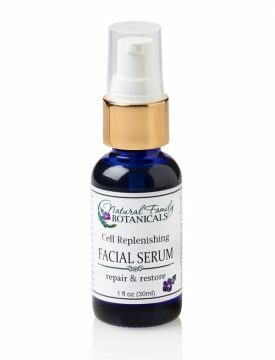 On weekends I alternate to Facial Replenishing Serum. And with all these products, a little goes a long ways. Kelly makes great products.